Yugioh Crossed Souls SE Advanced Edition Mini Booster Box IN STOCK! Duelists have greater Deck-building opportunities than ever before with the new Zefra monster theme that crosses over five different Deck types! Duelists with Shaddoll, 'tellarknight, Yang Zing, Nekroz, or Ritual Beast Decks can add their new Zefra monsters to upgrade their Deck, or power up their Deck of Zefra monsters instead. Crossed Souls also arms Duelists with new non-Zefra cards for their Burning Abyss, Madolche, Infernoid, U.A., Yosenju, and other Decks. The Yu-Gi-Oh! TRADING CARD GAME just got a powerful enhancement with the release of a new product configuration, the Crossed Souls Advance Edition! 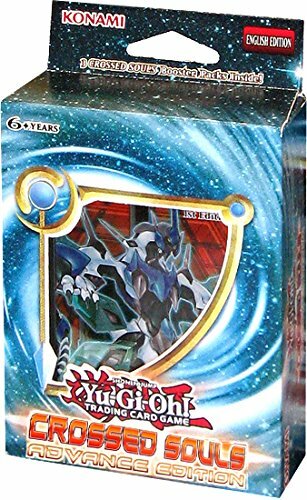 In addition to the 3 booster packs of Crossed Souls, Duelists will also receive 2 Super Rare cards, one from Crossed Souls and one from the upcoming booster set! In addition to the 3 booster packs of Crossed Souls, Duelists will also receive 1 of 2 Super Rare cards of Common and/or Rare cards from Crossed Souls, PLUS 1 of 2 foil version preview cards of non-foil cards from the next booster set, providing the ultimate value for Duelists!